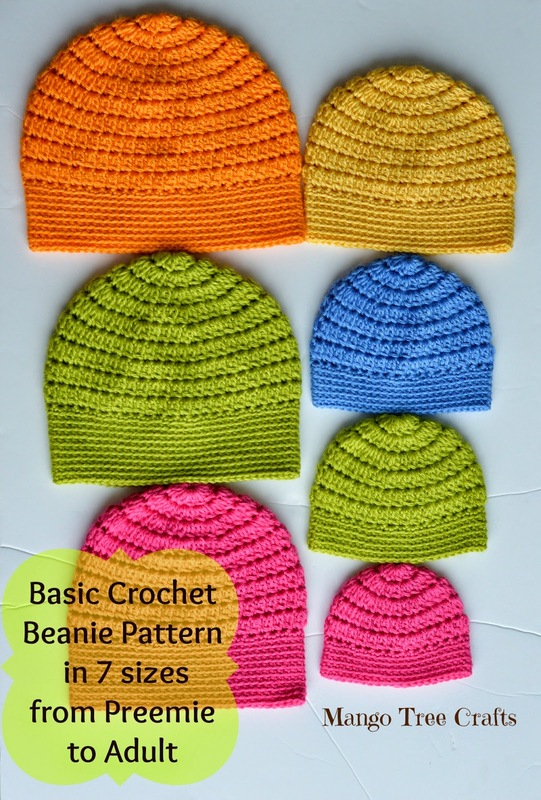 With spring just around the corner I would like to share this pattern of a basic crochet beanie with you. I designed it in seven sizes from preemie to adult. YO and draw through all 3 loops on hook. work *two SC in first stitch, one SC in next stitch*, repeat around, do not join, continue working in spiral (45). Round 7-10: SC in each stitch around in back loops. Crocheting in back loops gives your ribbing a nice ribbed look. Join with SL ST at the end of the last round. Fasten off and weave in ends. Round 7: Place marker. For the ribbing work *two SC in first stitch, one SC in next stitch*, repeat around (50), do not join, continue working in spiral. Round 8-11: SC in each stitch around in back loops. Crocheting in back loops gives your ribbing a nice ribbed look. Join with SL ST at the end of the last round. Fasten off and weave in ends. Round 8: Place marker. For the ribbing work *two SC in first stitch, one SC in next stitch*, repeat around (54), do not join, continue working in spiral. Round 9-13: SC in each stitch around in back loops. Crocheting in back loops gives your ribbing a nice ribbed look. Join with SL ST at the end of the last round. Fasten off and weave in ends. Round 9: Place marker. For the ribbing work *two SC in first stitch, one SC in next stitch*, repeat around (60), do not join, continue working in spiral. Round 10- 15: SC in each stitch around in back loops. Crocheting in back loops gives your ribbing a nice ribbed look. Join with SL ST at the end of the last round. Fasten off and weave in ends. Round 10: Place marker. For the ribbing work *two SC in first stitch, one SC in next stitch*, repeat around (66), do not join, continue working in spiral. Round 11-19: SC in each stitch around in back loops. Crocheting in back loops gives your ribbing a nice ribbed look. Join with SL ST at the end of the last round. Fasten off and weave in ends. SC in next stitch*, repeat around (71), do not join, continue working in spiral. Round 11: Place marker. For the ribbing work *two SC in first stitch, one SC in next stitch*, repeat around (75), do not join, continue working in spiral. back loops gives your ribbing a nice ribbed look. Join with SL ST at the end of the last round. 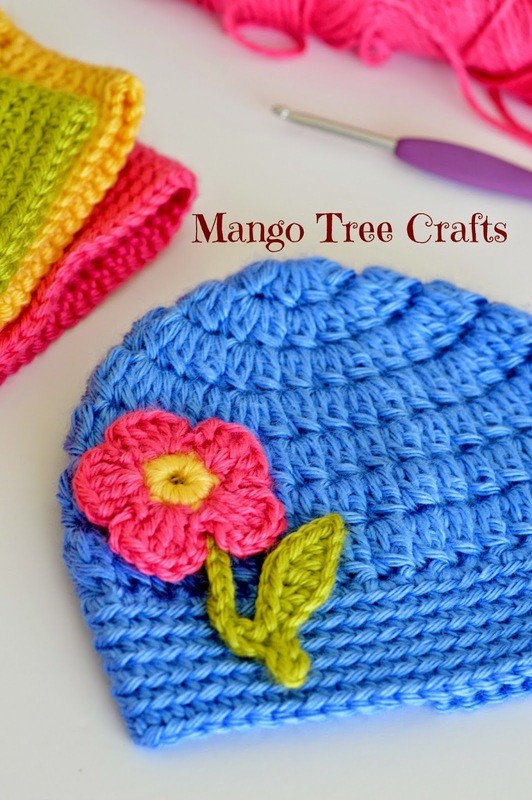 Fasten off and weave in ends.Updated March 2015: You can find this free flower crochet pattern that can be sewn onto the beanie here on my blog. 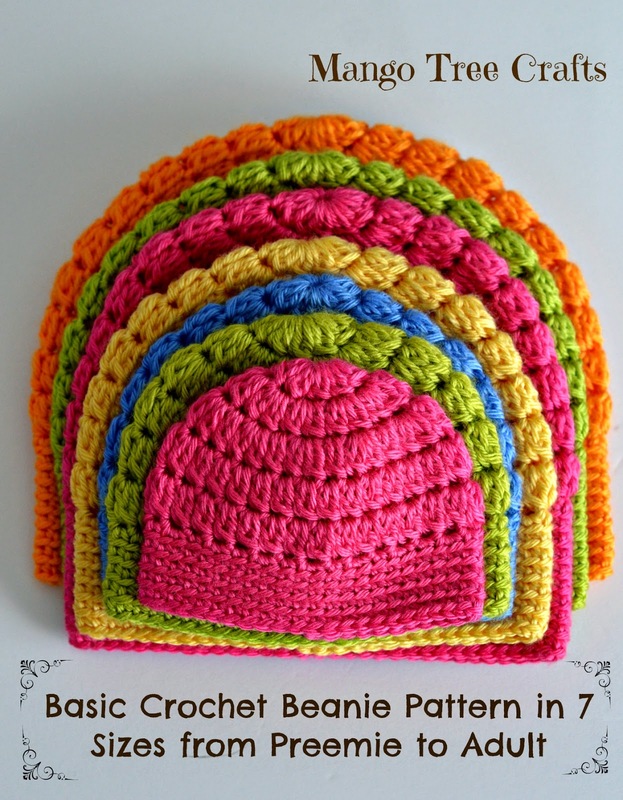 GOOD mORNING, iN YOUR PATTERN FOR SIZE 11 – aDULT, ROW 11 SAYS “DO NOT JOIN, CONTINUE WORKING IN A SPIRAL. I DON’T UNDERSTAND. hOW CAN YOU CONTINUE WORKING AROUND THE HAT WITHOUT JOINING IT? Do not join with a slip stitch like you did in the previous rounds. You may choose joining if you prefer that, but it will make the joining points visible. My hat does not have the small holes between the cluster stitch rows as shown in the picture. I must be insertin my hook in the wrong area or is it supposed to go in a back loop only? i made my grandaughter the 3-6 years it was too big, i am wondering if the 12 months-2 years will fit . she is just 3 now. Hi Laurie, just Place a “stitch marker” on your last stitch. Then continue the next row into the next stitch. You place , a marker , so you know where your row ends and starts. Enjoy! I Absolutely Love this pattern. IS it considered unisex?